The technology is patented. The performance is proven. The advantages are undeniable. Independent studies conducted at some of the nation’s top universities and research centers have proven the advantages of UA Performance Mouthwear. UA Performance Mouthpieces deliver an arsenal of physical benefits that help you train harder and compete at a higher level than ever before. 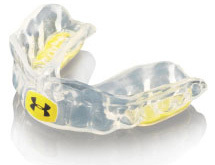 UA Performance Mouthguards provide those same benefits, with the added benefit of customised dental protection. To help you decide which mouthguard is suitable for you, please click here to view a flowchart. The ArmourBite® Mouthguard (featuring our patented Power Wedges™) unlocks the power of your jaw, while reducing the impact from blows to your jaw. So you can reach your full potential as an athlete, safely. Perfect for contact sports like football, rugby and hockey. Here’s an added edge that doesn’t feel like you added anything. The ArmourBite® Mouthpiece (featuring our patented Power Wedges™) fits snuggly – and stealthily – on your bottom teeth. In doing so, it unlocks the power of your jaw so you can be stronger, faster and better in any non-contact sport or activity. The ArmourBite® Mouthpiece delivers multi-patented technology. 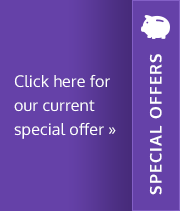 The performance is proven in independent scientific studies. The advantages are undeniable. A re-mouldable mouthguard – real versatilty as patients can mould it and re-mould it as it is made of a revolutionary Vistamaxxmaterial. Essential protection and locked-in fit. The UA Mouthguard delivers the essential protection, retention and locked-in fit that contact sports command. 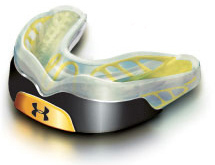 The EVA mouthguard material of the UA Mouthguard is contoured to ensure optimal fit and comfort. Better fit means less chewing, easier breathing and clearer on-field communication. Our patented polymer shrinks for a secure, locked-in fit so the UA Mouthguard stays where it’s supposed to — in your mouth. The ArmourPlate™ Insert delivers enhanced protection while the BiteFlex™ absorbs energy on impact. And our patented antimicrobial technology helps prevent germs to keep your mouthguard clean. The world’s first microwaveable mouthguard. 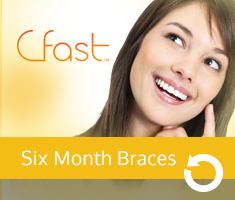 Ideal for patients undergoing orthodontic treatment. ArmourBite® (featuring our patented Power Wedges™) unlocks the power of your jaw, while reducing the impact from blows to your jaw. So you can reach your full potential as an athlete, safely. Plus, with this custom product, you can get the same fit, flair and functionality the pros do – in less than 20 painless minutes with ArmourBite® UK. Perfect for contact sports like football, rugby and hockey. The ArmourBite® Mouthguard delivers multi-patented technology. 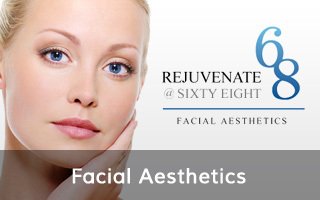 The performance is proven in independent scientific studies. The advantages are undeniable. Under Armour Performance Mouthwear™ Products are available in a wide range of custom colours. Custom components include the Mouthguard EVA, UA Logo Decal and Power Wedges. The UA Mouthguard and ArmourBite® Mouthguard can be personalised at no additional cost with the athlete’s name and/or number. ArmourBite unlocks the power of the jaw so you can reach your full potential as an athlete. From football, to hockey, to rugby… put it in and you’ll be stronger, faster & safer. Available in a wide range of custom colours. The UA Mouthguard offers the same great fit, comfort and retention as the premium ArmourBite® Mouthguard, but without the patented performance technology. Available in a wide range of custom colors. Built to boost the performance of non-contact athletes like runners, swimmers and golfers – even baseball and tennis players. Patented, built-in ArmourBite® Power Wedges enhance performance. 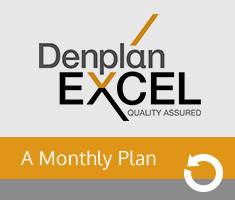 Denplan makes it easy to look after your teeth & oral health without any costly surprises! 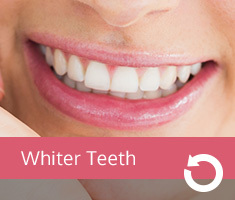 Looking for a bright, white smile for that big occasion? You're never too old to have whiter teeth! 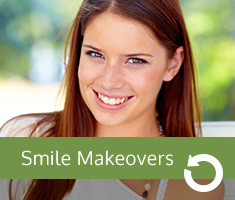 A fast and gentle cosmetic treatment to straighten teeth! 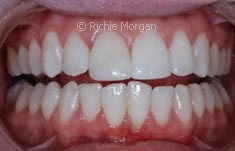 Please click on the buttons below which showcase examples of dental treatments completed for patients at Dentistry@68. 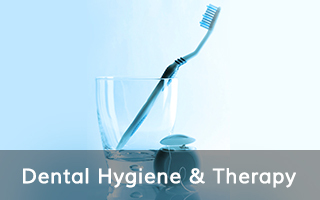 I have been a patient of The Wimborne Road Dental Practice since 1984 and have had various treatments carried out over the years, I can only praise, very highly, the work that has been done for me, I am always impressed by the professionalism and courtesy displayed while I am having work done or simply just a check up. As a small child and later as an adult I had always “feared” the dentist, but can honestly say, since I have been at this practice, I don’t anymore and actually look forward to going. If I ever have an emergency, I can always rely on prompt attention and total satisfaction. 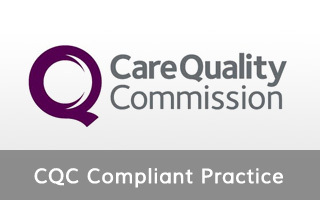 We do not schedule appointments over the lunch period (13:00 to 13:30) but the practice remains open and the reception is manned.